In addition to the apps that come with SharePoint, you can also add apps from third parties. These third-party apps appear in the SharePoint Store. 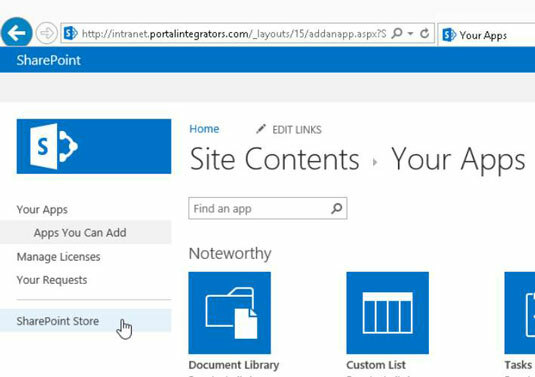 If you’re using SharePoint Online, then you have access to the full store. If you’re using SharePoint On-Premise, then your local IT administrators may have locked down the apps that you can add for security reasons. The SharePoint Store can be found on the Your Apps page. You access the Your Apps page by clicking the Settings gear icon and then selecting Add an App. 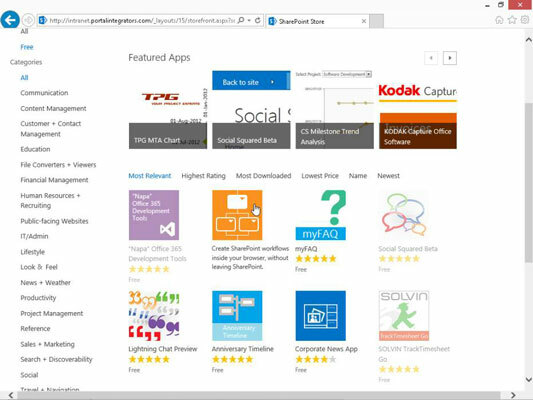 Take a look and see what SharePoint apps you have available in the store. You can choose to view all apps or only those that are free by selecting the Price refiner on the left side of the page. You can also sort apps by clicking a category link. If you want to purchase an app, click it and then click the Buy It button. After you click the Buy It button, you have to log in with your Microsoft account. If you already have a credit card on file with the Microsoft Marketplace, then you can purchase and download the app. Otherwise, you are prompted to enter your credit card information.